Тема в разделе "Список проблемных/неактивных/закрытых программ. ", создана пользователем All-HYIPs.info, 1 апр 2018. Платформа Mellson.biz разрабатывает финансовые инструменты и умножает личный капитал и капитал своих клиентов уже более трех лет. За это время были проанализированы сотни различных инструментов и услуг, которые позволяют получать пассивный доход. Из всего этого мы выбрали наиболее интересные и перспективные направления развития. На данный момент мы разработали наши собственные и уникальные инструменты для торговли на рынке FOREX и на рынке CRYPTO CURRENCY. В нашей команде работают профессиональные трейдеры FOREX и CRYPTO, менеджеры учетных записей ПАММ, разработчики новых, текущих торговых стратегий, эксперты в области стартапов. Используя именно такой набор инструментов, знания и профессиональное распределение средств помогли нам добиться отличных результатов, и в то же время риски сводятся к нулю. Каждый день мы работаем над тем, чтобы наши клиенты зарабатывали еще больше, и это было еще проще сделать. 01.04.18 09:05 Transfer Sent Payment: 50.00 USD to account U8085843 from U1294xxx. Batch: ‎210105739. Memo: Shopping Cart Payment. Deposit to Mellson.biz User allhyips. HyipInvest.net и Vladimirrr нравится это. The amount of 1.05 USD has been deposited to your account. Accounts: U8085843->U471****. Memo: API Payment. Withdraw to in****7 from Mellson.biz.. Date: 10:31 13.05.18. Batch: 214551021. The amount of 1.05 USD has been deposited to your account. Accounts: U8085843->U471*****. Memo: API Payment. Withdraw to in*****7 from Mellson.biz.. Date: 09:44 14.05.18. Batch: 214643027. The amount of 0.42 USD has been deposited to your account. Accounts: U8085843->U53*****. Memo: API Payment. Withdraw to goldens from Mellson.biz.. Date: 17:36 14.05.18. Batch: 214692589. Vladimirrr и HyipInvest.net нравится это. The amount of 1.05 USD has been deposited to your account. Accounts: U8085843->U471****. Memo: API Payment. Withdraw to in*****7 from Mellson.biz.. Date: 09:46 15.05.18. Batch: 214753898. The amount of 0.42 USD has been deposited to your account. Accounts: U8085843->U53*****. Memo: API Payment. Withdraw to goldens from Mellson.biz.. Date: 18:16 15.05.18. Batch: 214810185. The amount of 1.05 USD has been deposited to your account. Accounts: U8085843->U471****. Memo: API Payment. Withdraw to i******7 from Mellson.biz.. Date: 11:12 16.05.18. Batch: 214877760. The amount of 1.05 USD has been deposited to your account. Accounts: U8085843->U471****. Memo: API Payment. Withdraw to i*****7 from Mellson.biz.. Date: 10:10 17.05.18. Batch: 214977637. The amount of 1.05 USD has been deposited to your account. Accounts: U8085843->U471****. Memo: API Payment. 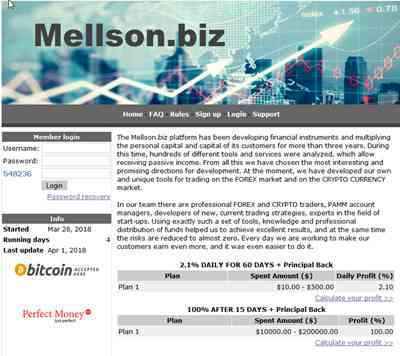 Withdraw to i****7 from Mellson.biz.. Date: 10:42 18.05.18. Batch: 215079635. The amount of 1.05 USD has been deposited to your account. Accounts: U8085843->U471****. Memo: API Payment. Withdraw to i******7 from Mellson.biz.. Date: 10:15 19.05.18. Batch: 215165982. The amount of 0.84 USD has been deposited to your account. Accounts: U8085843->U53*****. Memo: API Payment. Withdraw to goldens from Mellson.biz.. Date: 18:50 19.05.18. Batch: 215204393. The amount of 1.05 USD has been deposited to your account. Accounts: U8085843->U471****. Memo: API Payment. Withdraw to in*****7 from Mellson.biz.. Date: 10:19 20.05.18. Batch: 215245751. The amount of 2.1 USD has been deposited to your account. Accounts: U8085843->U471****. Memo: API Payment. Withdraw to i*****7 from Mellson.biz.. Date: 20:00 21.05.18. Batch: 215385805. The amount of 2.1 USD has been deposited to your account. Accounts: U8085843->U471****. Memo: API Payment. Withdraw to i******7 from Mellson.biz.. Date: 17:54 22.05.18. Batch: 215474344. The amount of 0.42 USD has been deposited to your account. Accounts: U8085843->U53*****. Memo: API Payment. Withdraw to goldens from Mellson.biz.. Date: 17:54 22.05.18. Batch: 215474348. The amount of 2.1 USD has been deposited to your account. Accounts: U8085843->U471****. Memo: API Payment. Withdraw to i******7 from Mellson.biz.. Date: 20:06 23.05.18. Batch: 215600531. The amount of 2.1 USD has been deposited to your account. Accounts: U8085843->U471****. Memo: API Payment. Withdraw to i*****7 from Mellson.biz.. Date: 16:16 24.05.18. Batch: 215683658. The amount of 0.42 USD has been deposited to your account. Accounts: U8085843->U53*****. Memo: API Payment. Withdraw to goldens from Mellson.biz.. Date: 18:22 24.05.18. Batch: 215696486. The amount of 2.1 USD has been deposited to your account. Accounts: U8085843->U471****. Memo: API Payment. Withdraw to i*****7 from Mellson.biz.. Date: 18:33 25.05.18. Batch: 215791614. The amount of 0.42 USD has been deposited to your account. Accounts: U8085843->U53*****. Memo: API Payment. Withdraw to goldens from Mellson.biz.. Date: 20:17 25.05.18. Batch: 215798478.